Jeffrey H. Jackson's new book The Soldiers With No Names offers a glimpse into the history of World War II at ground level through the story of an audacious anti-Nazi resistance campaign conducted by a pair of unlikely women -- Lucy Schwob and Suzanne Malherbe -- whose love story made possible the daring actions they took while living under Nazi occupation. Avant-garde artists, communist sympathizers, step-sisters, and lesbian partners, Lucy and Suzanne took on gender-bending identities while part of the vibrant 1920s Paris arts scene. Both are better known today by their artistic monikers, Claude Cahun (Lucy) and Marcel Moore (Suzanne). Like many of their famous painter and literary friends in interwar Paris, their photography, writing, and illustrations openly challenged traditional ideas about gender and sexual identity at a time when talking about such subjects could be scandalous, even in Paris. In hundreds of striking photographs, Lucy -- in her persona as Claude Cahun -- often posed for the camera in ways that confused viewers as to whether she was a woman or a man. Many photos show her with a shaved head. In 1937, Lucy and Suzanne left a politically polarized, Depression-era Paris for a quiet life on the island of Jersey. When the war came, the Germans realized the strategic importance of the Channel Islands and quickly took over; these islands would be the only bit of British soil the Nazis occupied. Lucy and Suzanne had many secrets to keep from the occupation force that arrived in July 1940. Their lesbian relationship might offend Nazi ideas about sexual morality, so they lived very private lives emphasizing the fact that they were sisters. Their communist politics also made them potential enemies. More importantly, Lucy’s Jewish heritage, something that they closely hid from the Germans, also made them targets. Faced with the dilemma of what to do and with so many reasons why the Nazis would have deemed them dangerous, Lucy and Suzanne could have kept their heads down and stayed out of the way, or they could have fled to England as many on Jersey did. Instead they chose to act. Sustained by their decades-long relationship and their well-practiced ability to keep secrets, Lucy and Suzanne hunched over their illegal radio listening to the BBC. Then, on an Underwood typewriter, they summarized reports of Allied victories, translating them into German since the occupying troops would never otherwise hear the truth. They also composed hundreds of notes, songs, poems -- translated into German -- and added drawings or bits of photographs, all aimed at demoralizing the Nazis with the message of an impending German defeat. When they went into town, Lucy and Suzanne tucked their notes deep into the pockets of Burberry overcoats. Approaching a café table in Jersey’s capital St. Helier, they pulled out one of their slips of paper and left it behind for a German to find. Or they hung it on a fence post, or slid it into the open window of a German car. Even more daringly, they slipped notes into the pockets of Nazi soldiers as they walked through the streets. Wherever they traveled, they also carried a bottle containing a powerful sedative so they could commit suicide by overdosing if they were caught. To make this strategy work more effectively, Lucy and Suzanne drew on their years’ worth of switching identities and undertook another act of gender-bending role play. They invented a German persona and authored the notes under his identity. They called him “The Soldier With No Name.” Through their notes to the Nazis, Lucy and Suzanne slowly used this fictional soldier’s words to craft an illusion that a vast, ongoing, international conspiracy was undermining the occupation of Jersey. This deception in the guise of a disgruntled German soldier, they hoped, would give a kind of authenticity to their words and frighten the occupying troops causing them to lose morale and mutiny against their leaders. Despite its simplicity, their strategy to demoralize the troops gained significant traction. But for their four years of effort, they nearly paid with their lives. In July 1944, the head of the German Secret Field Police and his henchmen raided their home. He had been searching for the scandalous “Soldier With No Name” and for years. The Inspector found much incriminating evidence, including notes, diaries, an illegal radio, typewriter, cameras, and other contraband. He threw Lucy and Suzanne into prison and repeatedly interrogated them. Later, as the court martial prepared for trial, a Nazi prosecutor came to question the women further. Kept apart in prison for months -- the first time they had been separated for decades -- Lucy and Suzanne both attempted suicide. Despite being in prison, they fought back, discovering ways to smuggle notes to one another and keep up their own morale. Even behind bars, Lucy and Suzanne fomented unrest against the occupation by encouraging prisoners to mutiny and spread defeatist messages against the Germans. Their trial was the climax of their resistance as Lucy and Suzanne confronted their persecutors face-to-face, even as they were being sentenced to death. The women languished in prison for 8 months, every day fearing deportation to a prison camp or execution. During that time they befriended other prisoners, including Germans who had offended their superiors. Lucy and Suzanne worked to help many of their fellow victims of Nazi imprisonment to survive. Their lives even became intertwined with those of their German guards who treated them relatively well, and they shared personal moments and intimate conversations with these soldiers who grew to realize that they could not win the war. As the war ended, Lucy and Suzanne were the last prisoners released from the prison on Jersey on V-E day in 1945, but Lucy -- chronically ill throughout her life -- died in 1954. Suzanne, sick and alone, killed herself in 1972. Although well-known in avant garde art circles in their day, Lucy and Suzanne were largely forgotten until their remarkable, often shocking, photographs were rediscovered in the 1980s and 1990s. Although they did not think of themselves as photographers at the time (Lucy was a writer, and Suzanne was an illustrator), the impressive body of edgy photography on which they collaborated has, in the last few years, become the subject of several major museum exhibitions (Jeu de Paume, Art Institute of Chicago, Tate Modern) and auction sales (Sotheby’s, Christie’s). Museums with major photography collections (MOMA, Metropolitan Museum of Art, Getty Museum) have all purchased their work within the past two decades. And contemporary artists whose work explores gender identity have drawn inspiration from their images, including Gillian Wearing's current exhibition at the National Portrait Gallery in London. 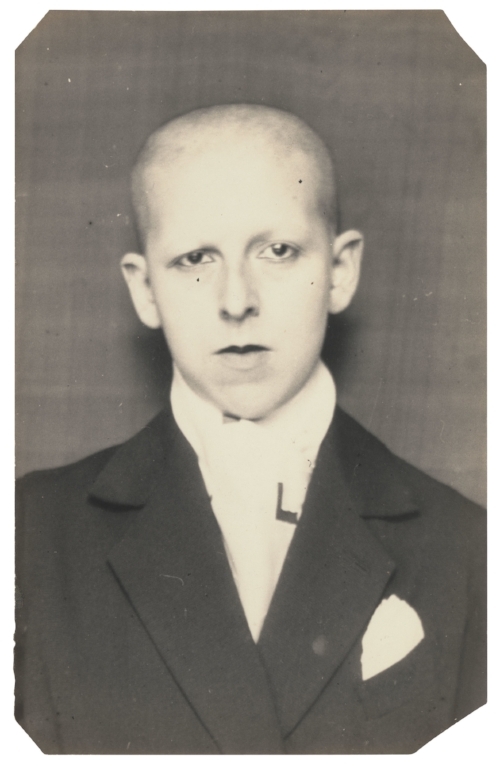 Today, any internet search for Claude Cahun and Marcel Moore produces hundreds of pages devoted to their groundbreaking imagery and also to their vision of sexual identity as more fluid than fixed.